Your dentist in Hamden is focused on helping you achieve the best oral health possible, but they should also be focused on protecting your overall well-being. Proper sterilization techniques serve a bulwark of safety that protects both you and your dental team from infections. 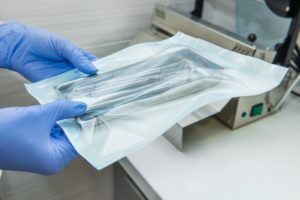 Let’s discuss why modern sterilization is so vital and how you can tell if your dental practice is taking all the necessary precautions. Mouths are brimming with bacteria. While most types of bacteria are harmless or even helpful, there are some species that are dangerous. Moreover, bacteria reproduce at lightning speeds. Without proper sterilization, it would be all too easy for microorganisms to spread from one patient’s mouth to another’s. A failure to maintain sterilization can promote the spread of illness. In severe cases, infections incurred in a medical setting can even lead to death. That’s why it is vital that you choose a dentist who places a heavy emphasis maintaining a clean office and who makes sure that their team members always take appropriate precautions that prevent the spread of harmful bacteria and viruses. Everyone wears proper protective equipment, such as face masks, gloves, eyewear, and a disposable gown or lab coat. The dental assistant or hygienist unwraps equipment after you arrive in the operatory. The longer equipment is exposed to the open air, the greater the chance that it will collect harmful particles. Hard to clean surfaces are covered with disposable plastic barriers or with materials that are easy to disinfect. The computer keyboard and mouse, X-ray unit heads, and the handles on the dental light should all be properly covered. There are receptacles where the dentist can properly dispose of used syringes and other hazardous materials. If the staff in your dentist’s office is serious about protecting you, they’ll be happy to answer any questions you have about their infection control policies. Feel free to ask them what techniques they use to sterilize equipment and their practices for cleaning an exam room after each patient. You can also speak to your friends who have visited a certain dentist and ask them how they felt about the practice’s cleanliness and dedication to patient safety. You should be completely confident in, not just your dentist’s skill level, but also their commitment to shielding you from infections. Use the above information to ensure that your oral health care team is doing all they can to keep you safe and healthy. The three dentists at D’Andrea and Pantera, along with our entire staff, are dedicated to protecting the oral and overall well-being of our patients. That is why we pay attention to even the smallest details to keep the risk of infection as low as possible. To learn more about the measures we take to ensure a sterile environment, contact our office at 203-288-0951.